We have been working on an interesting design scheme for a lower school in the village of Southill in Bedfordshire. The school acquired a plot of land next door and had aspirations to extend the playground to create a new and exciting play area for the children. 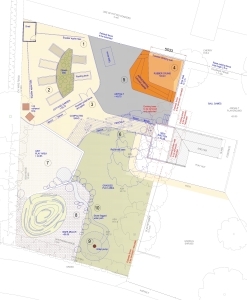 PCMS Design was asked to come up with a scheme that included a water feature, sand play, a climbing wall within a rubber crumb ‘ampitheatre’ area and a low mound to be fashioned as a ‘fort’. We have also included some modest structures such as relocation of and extension to a timber shelter and a new timber pergola. Children will have the chance to learn about growing vegetables and flowers too, with the inclusion of a ‘cottage garden’ area with raised beds. Planning permission was granted by Central Bedfordshire Council recently for the design scheme and change of use of the land to D1 (non-residential institution), giving the green light for the School to make a start on the adventure playground. This entry was posted in Bedfordshire, design, Lower School, planning permission, Playground on May 12, 2016 by admin. We were very pleased to attend the official opening last week of one of our pre-school projects in Caddington, near Dunstable. Bishop Peter Doyle from the Diocese of Northampton performed the ribbon-cutting duties at St Mary’s Catholic Primary School. 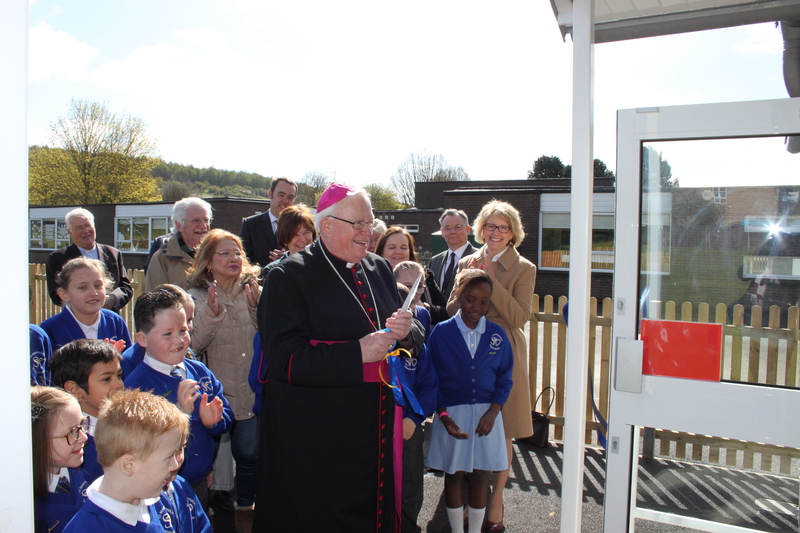 Pupils, staff and governors were delighted to have the Bishop officiating, and he was genuinely impressed by the range of facilities on offer for children from the age of two years upwards. Our building design includes a large multi-purpose playroom, with a separate kitchenette and office, and is able to run independently without need to use the welfare facilities of the school next door. An outside play space is also provided, part-covered with a canopy for wetter days. Up to 24 children can attend each session. This entry was posted in Bedfordshire, Canopy, construction, Early Year's, Pre-School, School Construction on May 5, 2016 by admin.